Forgotten Harvest, Metro Detroit's only mobile food rescue organization, recently took delivery of its first hybrid-powered truck. The Class 7 Freightliner, donated by Daimler Trucks North America, Daimler Financial Services, and Johnson Refrigerated Truck Bodies, will enable the organization to rescue 850,000 additional pounds of fresh food on an annual basis at a 30-percent fuel savings, according to a Forgotten Harvest statement. 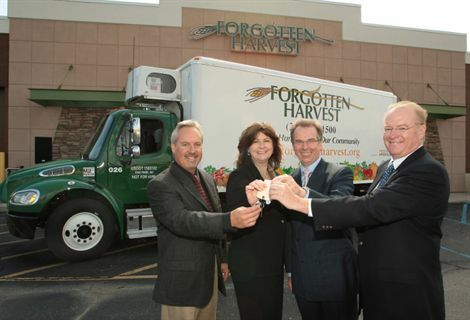 Susan Goodell, executive director of Forgotten Harvest, was presented the keys to the 2009 M2e Hybrid Freightliner diesel-electric truck by Klaus Entenmann, president and CEO of Daimler Financial Services, and Chris Patterson, recently retired president and CEO of Daimler Trucks North America, at Forgotten Harvest's Metro Detroit facility. Ron Ricci, president of Johnson Refrigerated Truck Bodies of Rice Lake, Wis., donated the 20-ft. fiberglass refrigerated truck body with ElectriMax, all-electric refrigeration that will keep the food fresh during deliveries to homeless shelters and social service agencies that feed the hungry throughout Metro Detroit. "This generous donation...will not only improve our operating efficiency by keeping fuel costs down, it will also allow us to direct more donated dollars to distributing food in a way that protects the environment," said Goodell. The 31,000-lb. Class 7 truck is the fifth truck donated by Daimler Financial Services and Daimler Trucks North America and aftermarket "body builders" in the past four years, bringing Forgotten Harvest's growing fleet to 21 vehicles.